When I walked into the Apple Store this summer to choose a new laptop for college, I didn’t really know what to get. The guy told me to get something small and compact, so I could use it to take notes in class. I looked at him and said that I would be handwriting my notes, and I already bought about seven notebooks. I could tell he was judging me, but I didn’t care. I have ALWAYS taken handwritten notes, and plan to for the rest of college. The real question is whether or not handwriting notes affects the way we process and learn the information being taught. One of the first arguments is that those who type their notes write down way to much, sometimes word for word what is being said. It makes sense though, because typing is faster than handwriting. Those who write out their notes, on the other hand, do not have as much time, therefore they process what is being said and are able to quickly paraphrase important information. According to NPR, a study was conduction by Pam A. Mueller and Daniel M. Oppenheimer on the topic, and was published in Psychological Science. A group of university students were to take notes on different TED Talks, and then be tested on the information afterwards. The laptop students wrote down way more, as expected. When asked about specific facts, both groups did well. The main point of distinction was when the students were asked more conceptual questions. The written notes students did much better. Another point made about using a laptop for your notes goes along with what Andrew always says…It’s a distraction to those around you and to yourself. We get it, lecture is boring sometimes, but as soon as you click over to Netflix or Amazon, everyone around you suddenly “clicks over” too. I only found the one study mentioned above on this topic, so I have a few ideas of how this could be further tested. First, I would study a larger group, like 500 students instead of only 67. Unlike in the study Mueller and Oppenheimer did, I would control whether or not the randomized group of students had a laptop or a notebook. That would be the independent variable and test results would be the dependent variable. Since it is randomized, that would eliminate possible confounding variables such as typing capabilities and speed of writing. After giving them a topic to take notes on, I would then give them the quiz similar to how the other study did. Another option could be to purposely place students with laptops in a lecture hall and have them on different sites being a distraction. After class, give a pop quiz and see how those around them did compared to those with no distraction around. This is something very simple, but could still give a good insight into the power of distractions in the classroom. Don’t get me wrong here, laptops are a great resource for college students, and I would never expect students to immediately switch over to handwriting notes after hearing about this study. Everyone learns in different ways. It is simply important to keep in mind that handwriting your notes, according to the study, could potentially benefit you on the next exam or quiz. This entry was posted in Uncategorized on October 12, 2016 by Anna Josephine Wisniewski. In high school, I always hand wrote my notes because laptops were not allowed to be used in the classroom. I hated this. My handwriting is sloppy and when studying my notes, I could never really read what I wrote because I had to write at a very fast pace to keep up with my teachers. Although I was able to get by, I never really achieved my full potential on tests because I could never really read what I was writing down. Now, in college, laptops are encouraged and used by students in most classes. Thanks to this, I have found it exponentially easier to study for exams because after teachers are done with their lectures, I can print out my notes and study them without having to try to decipher what I wrote. Your post made me eager to research this topic further. I was anxious to find a study that showed that people who type notes do far better on exams than students who hand write them. Sadly, all I could come up with were more and more studies linking handwritten notes to better performances. This makes me want to design a study of my own. I would take a randomized group of students, split them in half, and then designate which way they take notes throughout a regular college lecture. After the notes were taken, I would give them a quiz on the lecture they had just finished with. Because many studies claim that students who handwrite are more likely to retain their notes, the data should show this based on the test results. I would be eager to see how a study like this would turn out on a very large scale because students are all wired differently and learn in different ways. I’m actually so glad you looked at it from this angle! I know so many people in the same situation…They type their notes because their handwriting is just really hard to read. I like how you took it further and wanted to design something of your own to test it. I would be interested to see how that turned out as well. Also, not to stereotype, but it is usually boys with messier handwriting than girls. Not always, but usually. I would like to maybe split it up by gender and then do the tests. Perhaps boys overall do better with typing? Wow, now you really have me thinking!!! Thanks for the input, I appreciate it! I’ve always pondered over this question myself because I’ve always preferred hand written notes, but found that I could jot down the most information while typing on a laptop. However, laptops are a HUGE distraction – I’m often guilty of finding my eyes wandering to the screens open during a huge lecture class. It definitely has an impact on the information I retain from the lecture. I really valued your insight on the study, and how you implemented them into your blog post. The simple example you suggested testing of distraction vs non seems clear and concise and to the point, and I think it would be very interesting to see just how many students flunk the pop quiz after being surrounded by their peers on the laptops. All in all, I’m going to continue valuing my hand written notes, because ultimately they’re benefiting me and not serving as a distraction to other students! I love this post and I can definitely relate to this. I think this is a key reason why Andrew prevents us from using laptops during class. We can easily be distracted, and as you said, we just try and get the notes down as fast as possible, and then become distracted with the technology at hand. I personally do not use a laptop to take notes in any class, and I think it is better off that way. Also, if a student in front of me is taking notes on a laptop, I always see them copy down the notes rapidly, and then jump to a tab they already have opened, for example, Facebook or YouTube. Not only does this distract and fluster them from acquiring the information, it also distracts me because my eyes will immediately jump to their computer as well. Ultimately, I think laptops should be banned from college classes because it perplexes not only the student partaking in taking the notes on the laptop, but also perplexes the environment around them. Great post. I like this post, because I too prefer handwriting my notes! I like how you mentioned the study that was done, but then suggested improvements that could be made so that the results could be more accurate and reliable; it’s a good application of what we have learned in class. I am surprised however that there have not been more studies done on this, so you may want to mention the file drawer problem here. Interesting topic to blog about because in one way or another this is going to affect every college student. I have always been the person when it comes to studying that I am constantly writing things down, and then rewriting it in hope of remembering everything. But coming into college, I came to the realization that typing my notes might be the better option. All the classes are moving a lot faster so you have to do everything possible to keep up with it. Personally I thought that the best way to accomplish this was to type all the notes. But then I later learned that just makes it so much easier to get distracted. I can say from personal experience that the classes that I don’t use my computer, I have a tendency to pay more attention to the lecture. Sitting in one of the lectures, looking around all you see are kids on their laptops doing stuff other then taking notes. The age of modern technology is partially hurting our education because of things like this. I really enjoyed reading this blog post. I also handwrite my notes. I noticed whenever I would bring my laptop to class I would always text off of it and online shop. I also like studying from handwritten notes in my notebook than off a computer screen or printed pages. Here is an article that explains that students who write their notes out have a deeper understanding of the material. I couldnt help but comment on this blog post. I absolutely agree with you. Taking notes is the best! I have made a lot of videos talking about why note taking is so crucial. With taking notes you can make notes on the side, and write words in a way that helps you out. People even draw pictures as examples all the time. My biggest point is that wrtiting stuff out literally reinforces the concept so much better into my head. I am taking film classes, and we learn a lot about lighting. I spent about 4 hours total taking notes on just 1 chapter of lighting. It was a lot of work but now I can tell you a lot of lighting. I know so much more information that I ever thought I would know. It is just such a good feeling. I also completely agree with your statement about people writing more. A lot of people just wrtite, but they dont understand those key concepts. Moreover kids literally typing everything down, as you said, people might not be engaged at all! Kids might be hearing what the professor has to say, but we arent actaully listening, and thinking about what it said. Another amazing point is that when we have a pen and paper, we are going to be more selective of the facts and notes we write down. So I feel like the x variable is the way one take notes. The Y variable would be how well one does in the class. getting distracted on other websites would be a 3rd variable, because there still are people who can do really good with taking notes on a laptop. This is a great topic for a blog post. It is relevant with college students since we are taking notes in every class. I thought your blog post was well written. I know you said there was only one study done on this topic, but maybe you could have tried to find articles about it or other scholarly opinions. I do like how you gave your own input though. I agree with you that I would make the experimental study group larger. I don’t quite understand your second to last paragraph about putting people with laptops in different sections to be distractions. I would have just kept the focus on laptop note taking vs. handwritten note taking. I am a person that hand writes their notes as well. 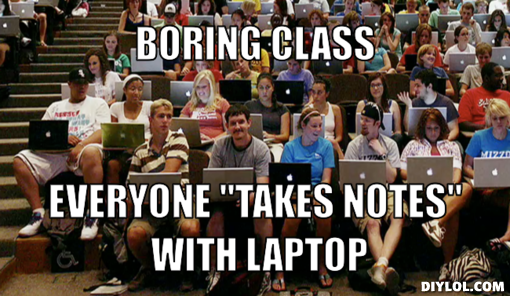 I have seen however, many people taking notes on laptops in my classes. I thought about it, but I think I’m going to keep it old school for now. 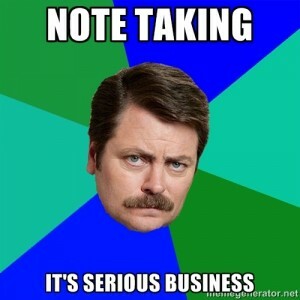 A lingering question of mine is does laptop note taking enhance your learning? Or does the brightness of the screen and distractions on a computer debunk learning? Here is an article from the Harvard Business Review and their take on laptop note taking.